Located on the Western Coast of Newfoundland, approximately 42 kilometers outside the City of Corner Brook, the beautiful and scenic towns of York Harbour and Lark Harbour is home to breathtaking scenery, hiking trails, whale watching, fishing, day parks and more. 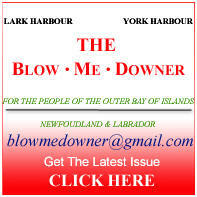 The Blow-Me-Down Provincial Park, situated on a peninsula that lies on the boundary of the two communities, offers it's own hiking trails, 28 camp sites and an observation tower accessed by staircase to lead you through a cave to access and showcase a panoramic view of the Bay of Islands. 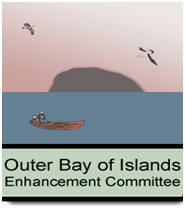 We welcome you to explore the Outer Bay of Islands and all it has to offer. Our sister communities offer many great attractions. With a Bed & Breakfast, restaurants, cafe's and a 4 1/2 star Hotel that offers guests a great view of the Bay of Islands and located at the foothills of the Blow-Me-Down Mountains. Visit Bottle Cove Beach and enjoy a beautiful sunset on the boardwalk, go kayaking, take advantage of the great hiking trails in Bottle Cove or walk along the beach and explore the naturally carved “sea cave” on the south side of the cove. Marlaine's Cafe which has beautiful pastries, soups and sandwiches and a whale watching deck. Captain Cook's Restaurant in Little Port, sometimes offers the local catch of the day in their menu. Captain James Cook surveyed and chartered the coasts of Newfoundland between 1764 and 1767. Among the vessels assigned to the Newfoundland squadron where the H.M.S York and H.M.S Lark, after which the harbours, and later the communities, were named. The Outer Bay of Islands, (consisting of York Harbour and Lark Harbour, which also incorporates Bottle Cove and Little Port) first saw permanent settlers in the early part of the nineteenth century. Hiking in the Bay of Islands is simply breathtaking! Our trail network connects to places such as the Captain Cook Monument at Lark Harbour, the beautiful remote beach at Cedar Cove, the scenic coastline and sea caves around Bottle Cove, and the hiking adventures of the Blow Me Down Mountains, the Copper Mine to Cape Trail. There are trails suited for all ages.